Disku daudzums iepakojumā: 1 gab. Disku daudzums iepakojumā 1 gab. * SCCG CD/DVDR '03 - '09.This is a disc with an outer diameter of 8cm providing 1.46GB capacity (2.6GB for DL discs). Mainly used for camcorders. Limited compatibility with slot-loading drives. DVD+RW is a rewritable disc providing 4.7GB capacity. Compliant with the +RW-Alliance specifications. 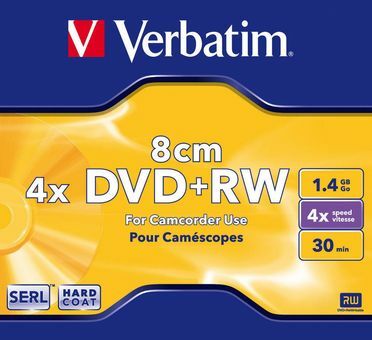 Verbatim's DVD+Rewritable use a Super Eutectic Recording layer (SERL). SERL ensures that noise-free recording can be enjoyed time and time again. With conventional rewritable media, the recording layer deteriorates with every rewrite, meaning a decrease in quality. With Verbatim rewritable media however, the recording layer is returned to perfect condition on every erase cycle, leaving a flawless disc for the next recording. DVD+RW is a sequential read / write media primarily designed for video recording and streaming backup applications. DVD+RW discs can be written up to 1000 times. A number of DVD-ROM drives and DVD video players support DVD+RW. Increased resistance to UV light.